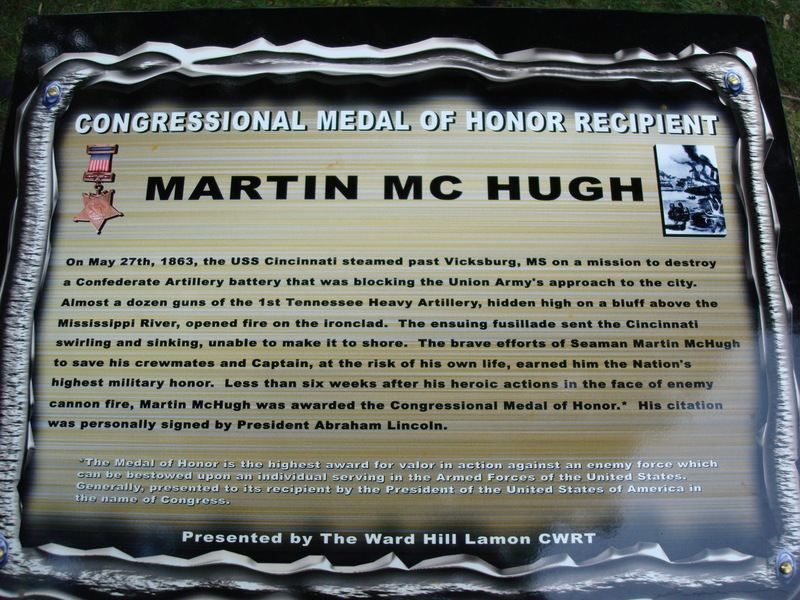 Can You Help Find Medal of Honor Recipient Martin McHugh's Descendants? A previous post on the site looked at the efforts in 2012 to honour Seaman Martin McHugh in Danville, Illinois. 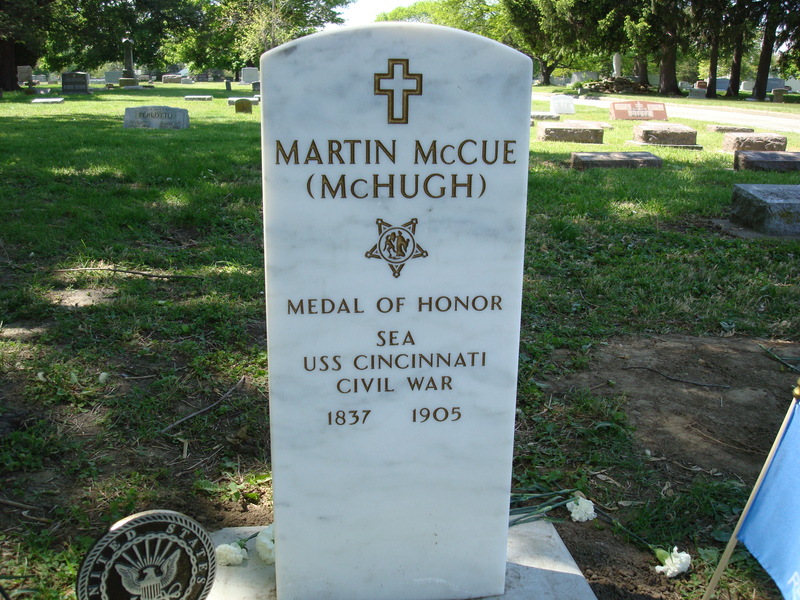 A Medal of Honor recipient for his actions aboard the USS Cincinnati at Vicksburg on 27th May 1863, Martin had lain in an unmarked grave for over 100 years. Machelle Long played a central role in having Martin remembered and has kindly written a guest post on her ongoing work on the Galwegian. She is now seeking assistance from readers of the site in an effort to track down a living relative of Martin. As time draws near the 150th anniversary of the brave action for which Irish-born Martin McHugh was awarded the U.S. Medal of Honor during the Civil War, I would like to thank Damian Shiels for inviting me to do this guest post. I was honored to work with a great group of extremely knowledgeable researchers and historians in the research of Seaman Martin McHugh following initiation of the research in 2010 by the United States Medal of Honor Historical Society. Our research group and the Historical Society were intent on a common goal of preserving the honor of this brave man who, with his wife Catherine, lay in an unmarked grave in Danville, Illinois for 105 years. On April 21, 2012, that unfortunate situation was rectified with a ceremony honoring Seaman McHugh. 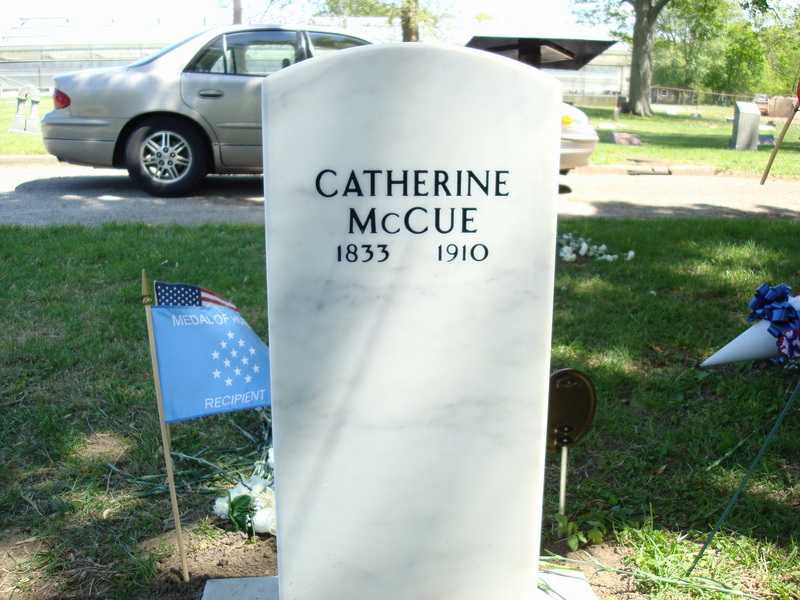 The highlight of the ceremony was the unveiling of his newly set U.S. government issued Medal of Honor grave marker which also marks the grave of his wife, Catherine. Seaman McHugh was born in 1837 in County Galway, Ireland. He immigrated to the United States in the early part of the 1850s. His mother (Bridget McHugh) and three sisters (Bridget, Sarah, and Catherine) immigrated at approximately the same time although we have not been able to determine the exact time of his arrival in the United States or if he and all of his family members arrived together or at various times. Seaman McHugh came to Danville, Illinois as early as 1856 where he worked as a laborer before enlisting in the United States Navy in October of 1862. The climax of his Civil War service was during an engagement with the Vicksburg batteries when, after heavy Confederate fire, the ship on which he was serving sank. Seaman McHugh and four of his shipmates were awarded the Medal of Honor by President Abraham Lincoln on July 17, 1863 for their brave actions during that engagement. Those actions included saving the lives of shipmates and the ship captain who could not swim. He served in the Navy until June of 1865 when he returned to Danville, Illinois and began a career working in the coal mines which spanned nearly three decades. In October of 1865, he married Catherine Griffin and subsequently had five children. One child died in infancy, however he and Catherine raised four daughters, Mary (b.1866), twin daughters Katherine and Margaret (b.1869), and Sarah (b.1871). Mary later married Ed Rabbeson and eventually moved to Chicago and then on to the state of New York, Margaret (who was also known as Maggie) married Daniel Beam and settled in Bloomington, McLean County, Illinois, and Sarah (who was also known as Sallie) was first married to Walter McElhaney then to Perg Smith and remained in Danville, Illinois. Katherine (who was often called Kate) never married and returned to Danville, Illinois after her father’s death to care for her mother. In the 1940s, she was shown living in Peoria, Illinois. There were known children born to Maggie and Sallie however no further generations could be traced. Seaman McHugh died at the National Soldier’s Home in Danville, Illinois on February 23, 1905. His funeral was held at St. Patrick’s Church in Danville (of which his sister Bridget and her husband John Flaherty were a founding family) and he was interred at St. Patrick’s Cemetery, now known as Resurrection Cemetery. Martin’s wife Catherine continued to live in Danville, Illinois until her death in December of 1910. Our final goal and a hope that we have kept alive throughout the research of Seaman McHugh is to locate a living blood relative of Seaman Martin McHugh. Damian has been kind enough to allow me to reach out to his readers through this post in hopes that we might accomplish this. After more than a century of being forgotten, his honor and memory are now kept alive locally with speeches, remembrances, and memorial services. We think it fitting that his honor be shared with his family and we look forward to hearing from anyone who may have information on a family connection to Seaman McHugh. If you have information that you feel may be of interest to Machelle in her efforts, please leave a comment on this post or email the site directly at irishamericancivilwar@gmail.com. Hi, Machelle. Thank you for the work you’re doing. There are a couple private profiles on ancestry.com listing a Martin McCue born 1837 in Ireland in their family trees. One of these specifically says their Martin was born in Galway. Have you tried reaching out to them? If you don’t have an account, I can shoot them a message for you. Best of luck in your search! Hi Brendan. Thank you for the good wishes and for the suggestion! We utilized Ancestry often over the last few years, particularly in tracing Martin’s children and his grandchildren that are known to us. We followed up on one lead from Ancestry but, unfortunately, it did not turn out to be our Martin. I have access to Ancestry and I will definitely check for new additions since my last visit! Thank you again! Kate – thank you for the link! Daniel and Maggie are our best hope in finding a living relative as they had several children. Walter, shown on the headstone with them, was their son who died in childhood. 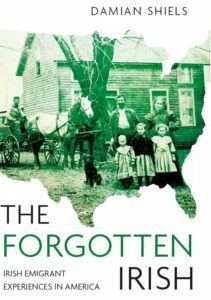 All of their adult children were daughters which made them a little more difficult to trace because of married names and the fact that they seemed to spread out across the states! We did manage to get a pretty good lead on 4 of the 5 girls tracing some of them to their death. Unfortunately, we found no children born to any of Daniel and Maggie’s daughters. Today, I am posting from home and I keep my McHugh research at work. When I return to work on Monday, I will gather the information on Seaman McHugh’s grandchildren to post. Perhaps someone will recognize a connection. By this time, it would be Seaman McHugh’s great-grandchildren or even great-great grandchildren that we hope to find. Release of the 1940 census has helped but we still have not met with the success we’ve hoped for! Seaman McHugh’s daughter Sallie also had two children. One of them died in infancy but the other was a son named Howard McElhaney. Howard was found on Ancestry and actually served in WWII, enlisting when he was in his 40’s. He passed away in 1985 and is buried in a National Cemetery in Calverton, NY, however again we have found no record of children of Howard. I’m excited on getting this information so widespread and my fingers are continuously crossed! Thank you! Hi what a great story and lots of hard work for you all. I wish you every luck in finding Martin’s descendants. Louise – Thanks so much for the kind words and your support! I would be thrilled if you would by chance find a tie to Martin in your McHugh connections! This is such a wonderful opportunity to share our search and the support already received is tremendously appreciated. Mary Angeline (dob 1897 Danville, IL) Married name likely Marshall or Clausen. No date of death is available for Mary. Dorothy L. (dob circa 1908 McLean County, IL) Married Arthur Wetzel in 1944 in Cook County, IL. No date of death available. Much of this information was obtained from Maggie’s obituary and from Ancestry.com. This info was obtained over the course of the last year but there may be recent updates to Ancestry that I haven’t seen. I welcome any suggestions of new information that may be available! Thank you! Thank you for this lovely site and information. I have been in contact previously with someone about family connections. My great-great grandmother was Sarah McHugh, who was apparently born in Co. Galway, came to settle in Cincinnati, and married Keiran Keyes there. Until I read the above information, I don’t recall seeing Seaman McHugh’s mother’s name as Bridget. Sarah McHugh Keyes’ cemetery record does give her parents’ first names as David and Bridget. Would like to know if my Sarah is your Martin’s sister for sure! Martin and Ann – So happy to see your inquiries! In regard to the father of Martin McHugh, during the course of our research we were never able to determine his father’s name. According to Catherine’s deposition in her Widow’s Pension file, Martin came to the U.S. with his mother and his sisters. No mention was ever made of his father. Additionally, no documentation listing Martin’s father was discovered. Martin’s marriage license to Catherine was issued in 1865 prior to retention of application information therefore father’s name is not contained in that documentation. Martin deceased prior to the State of Illinois requirement that death records be filed so father’s information was also not available on a death certificate. Of Martin’s three sisters, documentation on Sarah was the most scarce. Marriage licenses, census records, and documentation of children born were available for Bridget and Catherine, but the only real mention of Sarah we found is also in Catherine’s deposition in the pension file when she listed Martin’s sisters as Bridget Flaherty, Catherine/Kate Carrell, and Sarah Murphy. We did not find record of the first name of Sarah Murphy’s husband but Catherine further stated that Martin’s sisters all lived here in Danville and that they were all deceased at the time of her deposition. I would love to establish a connection to the Sarah McHugh you both mentioned…but the evidence seems to indicate she probably isn’t our Martin’s sister. Would love to hear from you with any additional ideas! Thanks for the comment! When did your family emigrate from Ireland?